You remember the feeling well: As the last guest walks out the door, your satisfaction of hosting a fun party turns to dismay as you look at the mess you have to clean up. So, as you’re planning your next get-together, follow these tips from The Alleen Company to prepare yourself for easier after party cleanup. Before the party starts, make sure the kitchen is clean and that the dishwasher is empty. That way, you won’t be behind with cleaning before you even get started. Try to clean up after yourself as you are preparing the food and doing other party prep. If you’re looking for easy party cleanup, consider renting linens and tableware. You might be surprised that it is more affordable than you might think and could be well worth the price for what it will save you in time. 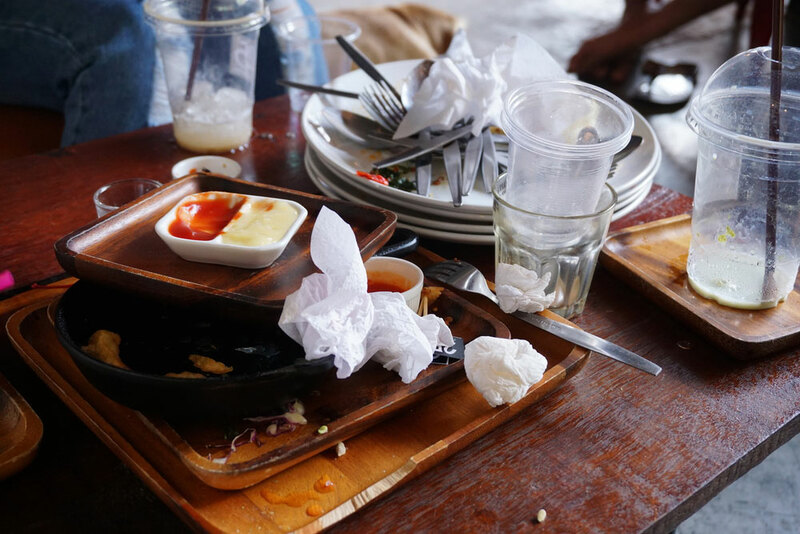 Rented tablecloths, napkins, glasses, dishes, and eating utensils, can all be returned to the rental company dirty. That means you can skip washing dishes or doing laundry as part of your post-party cleanup. If the rental route isn’t an option, you can use disposable cups, dishes, tablecloths, napkins, utensils, and tablecloths. Since these are easy to find and inexpensive, they are an affordable option that makes cleanup easy. If you use all disposable items, you can simply gather up the tablecloths with everything on them and throw everything in a trash bag. This way, clearing each table will only take about 15 seconds. Whether they are disposable, rented, or from your own linen closet, always use tablecloths. They protect your tables from spills and stains and make party cleanup easier. You can toss disposable tablecloths in the trash and reusable tablecloths can be shaken off in the trash and tossed in the washing machine for easy cleaning. Have a trash can in an obvious, convenient spot for guests to use. Most people want to be polite and clean up after themselves as much as possible. Help them help you. The Alleen Company has card board trash cans that are available for rent that will make your clean up process so easy! If you are hosting a dinner party or other shindig that you expect with have food left over, have containers handy so guests can help themselves. That way they will do part of the post-party cleanup for you by cleaning out the serving dishes. Even when you’re hosting the party, you should be able to have a good time without worrying too much about the cleaning afterward. Our professional staff is ready to take care of it all. We can deliver china, glassware, and flatware, and pick up the china, glassware, and flatware. All you have to do is rinse them off! If you rent our linens, we will launder and press them for you. With The Alleen Company, your party is in good hands, so unwind, have some fun, and enjoy time with your guests. Contact us online or call (513) 769-0393 for more information. What Skills Do You Need to Be a Successful Event Planner?